Furs on Film – What a Way to Go! 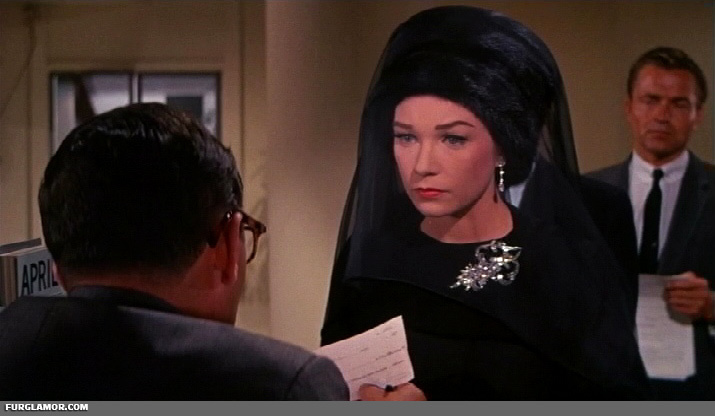 In her current life, Shirley MacLaine stars as Louisa May Foster, a very rich, very unhappy woman who finds herself on a psychiatrist’s couch, retelling the various stories of how she tried to marry for love, not money. In each case, her poor, loveable husband of choice ends up striking it rich, neglecting her, and then dying, leaving her increasingly well off, but still unhappy. The film is an anthology of sorts, with Lousia’s time on the couch the framing device. As surprises no one, the process starts to repeat itself just before the credits roll. 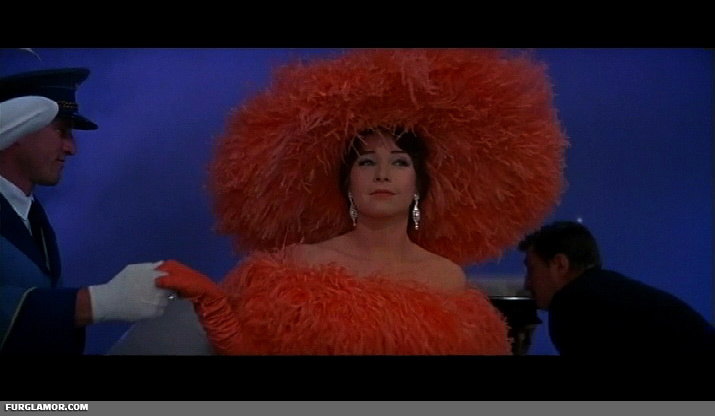 Shirley wears pretty much all the furs in the film. Part of the charm of the film is the framing sequences at the psychiatrist’s office all feature Miss MacLaine wearing a mink hat. The remainder all occur in the flashbacks to her various relationships, culminating in one of the best uses of dyed fox in film history. 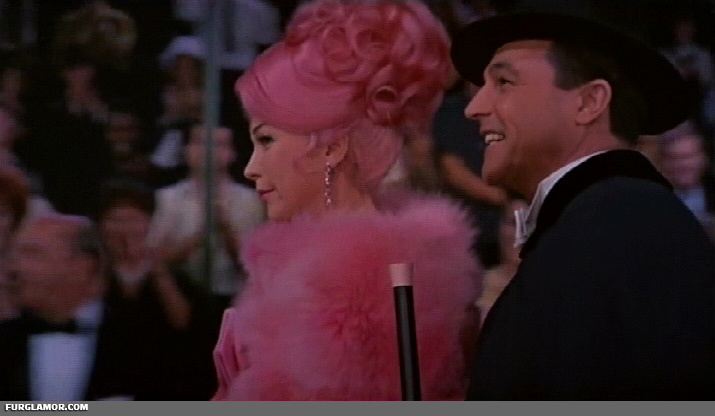 Due to the length of time it appears, there are many nice close ups of Miss MacLaine capped by the mink. As should be a surprise to no regular reader, I’m not a mink fan, but I do like the hat. Sure, it should be fox, but, well, split milk and all. More mink from Husband One’s story. This conservative mink fringe is hooded, at least. After suffering through Husband Two with nary a fur in sight, things pick up with Husband Three. Already rich, Lousia meets Rod Anderson, equally if not more wealthy, at the airport. She’s wearing a fox hat and this fox fur trimmed coat. 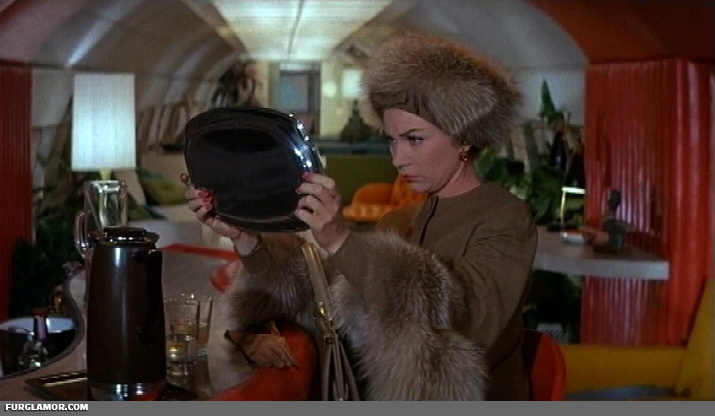 This is a long sequence, as Lousia goes aboard Rod’s private jet and chats all while keeping the furs firmly in place. Sadly unlike many of the furs in the film, this is fairly conservative fox by any standards. 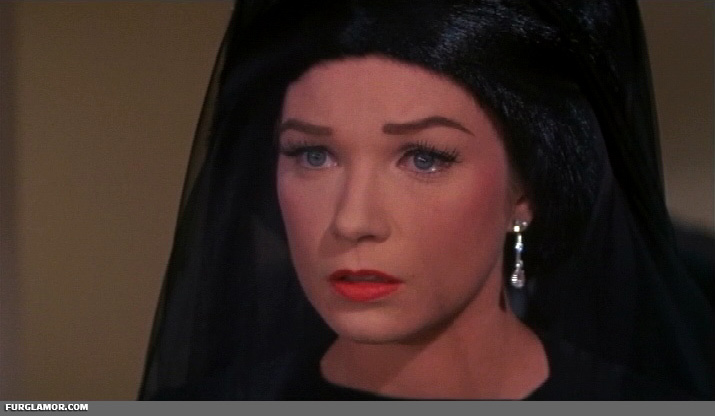 She flips that around in the film’s fantasy sequence, as Louisa imagines life with Rod and their money combined. In the sequence she wears a series of outfits by Edith Head, intentionally “over the top.” The first is more feathery than fur, obviously. Things pick up a bit when the white mink trimmed outfit with the rather large muff appears. While again, mink isn’t particularly my favorite, this is certainly of one my favorite minks. Finally there’s the first of two dyed foxes in the film. Would have picked something other than yellow, myself (like the color of the film’s second dyed fox), but still, not too bad overall. Each element of the fantasy sequence is fairly brief, so individual elements do not get a lot of mileage, but a whole thing is about a minute and some change. Finally, Husband Four’s story provides the marquee fur. Lousia meets and marries Pinky Benson, a stage performer who, after they’re married, becomes an overnight Hollywood success. 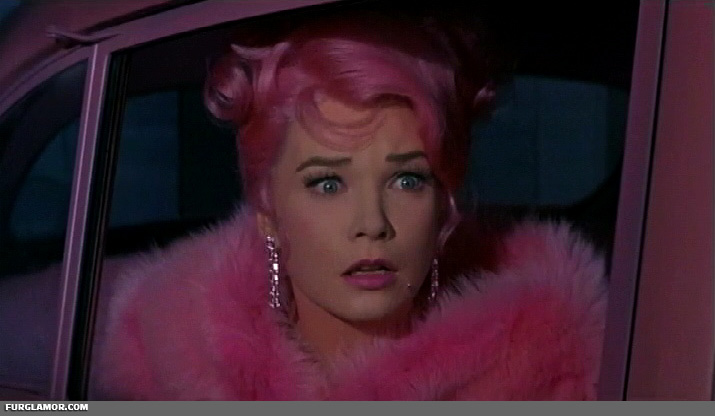 Pinky “embraces” his name, surrounding himself with his namesake color, and that includes Louisa’s wardrobe. 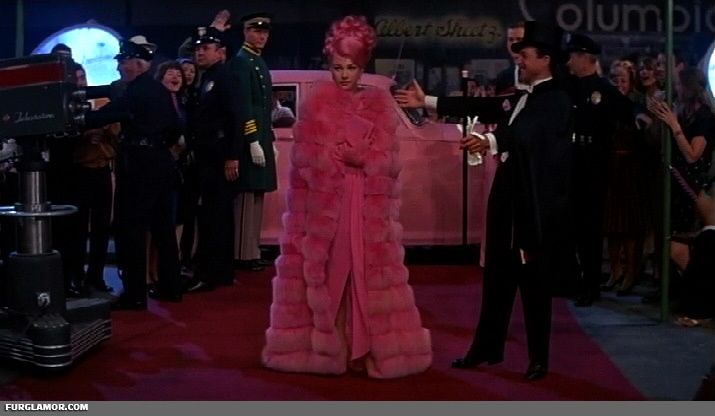 The dyed pink fox fur cape is spectacular. It’s supposed to be, and the dyed hair to match is, well, “the cherry on top” is, yes, very, very cliché, but I’m going there. Even get a quick bonus of double fox in this part of the scene. That lynx-dyed fox isn’t exactly well shot, though. 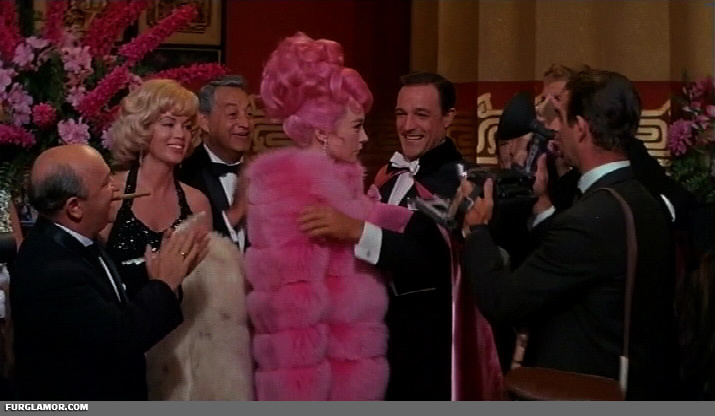 Finally one close up of Miss MacLaine in her pink wig and huge pink fox. 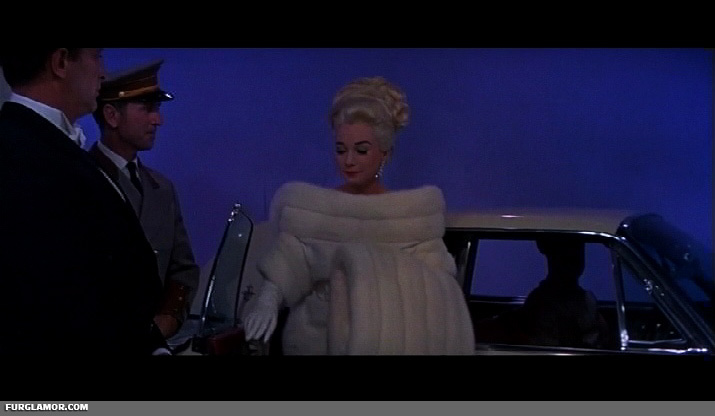 While the point of this was to lampoon Hollywood excess (and is the only reason it even appeared in a film shot in 1964), I would suggest to any lovely lady they can consider a cape like this for the average trip to the grocery store or cinema. Just think about it, that’s all I’m saying. The full fur runtime of What a Way to Go! clocks in around 23 minutes. Now, all of that isn’t the large pink fox cape, sadly. 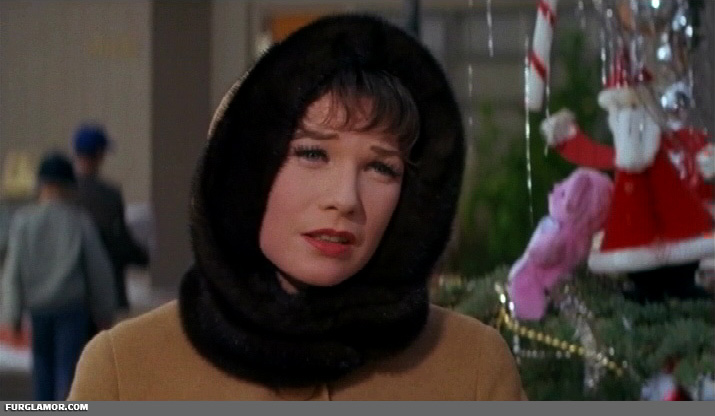 Miss MacLaine wears her mink hat through pretty much all of the framing story, and while I don’t want to say that “pads” the runtime a bit, others may not be so kind. The fox hat and trim from the third story consumes the other big chunk. The best parts, her fantasy sequence and the pink fox are about four minutes combined. Still, for the 60’s, this is an amazing little gem. 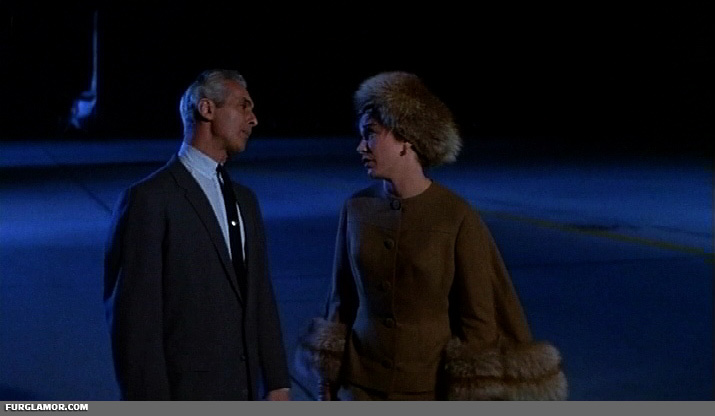 Full Gallery: Fur Fashions of the 1964 film What a Way to Go! Great post and so informative! I mentioned this post and your blog on mine: I hope it’s okay. 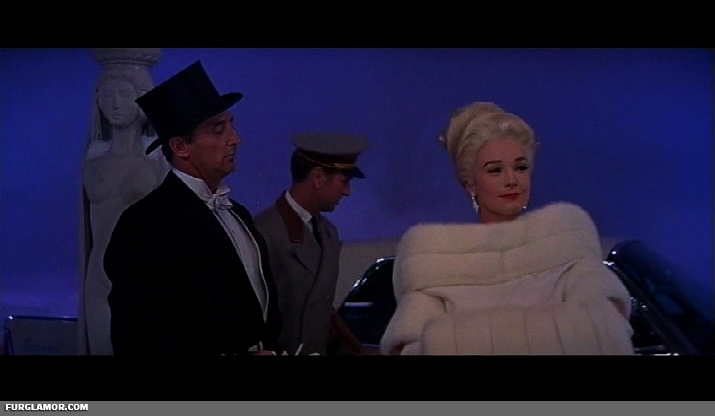 Certainly, I hardly think wearing furs should be confined to the silver screen. hello! is it okay to use your screen caps in blog posts?